You likely rely on a lot of different tools to get your work done. When you connect those tools to Slack, you can more easily pull information from various siloed places into channels where your team discussions are taking place. Then everyone has greater visibility and can move forward quickly and confidently. There are more than 1,000 apps that integrate with Slack today, and more are added to our App Directory every week. Here’s a roundup of the latest integrations worth checking out. Struggling to explain a detailed concept to a teammate? Sometimes it’s easier to show rather than tell. Loom is a video communication tool that makes it easy to create and share instructional videos. Use the Loom Chrome extension to capture an image of your screen, record your face, and narrate what’s happening. You can even add bookmarks to highlight certain parts of the video and create folders of videos that fit together in a series. Once you’re ready to share the video with your team, you can pick your desired Slack channel, add a message, and voilà: The video is posted into Slack where anyone on your team can play and watch it. Create visual training materials: Teach your team about a new tool or process and help new hires and contractors get up to speed. Give clear feedback quickly: Report bugs with more accuracy or give detailed feedback on contracts and proposals. Whether you’re opening hundreds of retail locations or staging the world’s most-watched sporting events, big projects need more than just a spreadsheet to keep work on track. Smartsheet is a tool that helps teams plan, track, automate, and report on the status of complex projects. 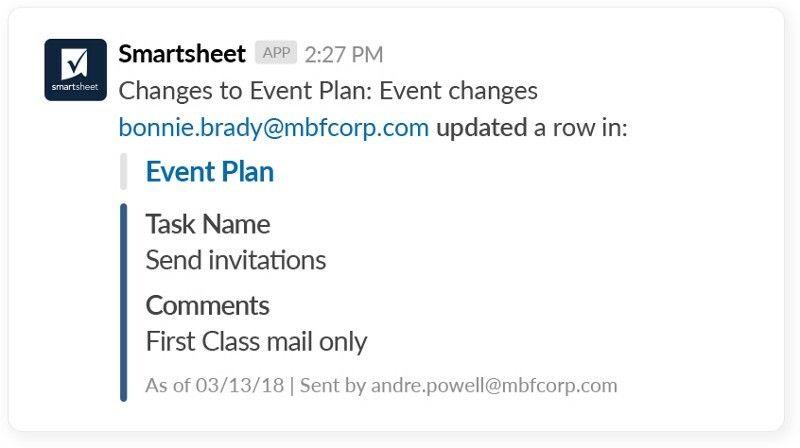 You can even have notifications sent automatically to specific Slack channels, keeping your team up to date on changes both big and small that require swift action. Manage paid media budgets: Get a message in Slack when a new request is created. Keep track of sales enablement materials: Find out when new collateral is available that needs reviewing or approving. Organize deadlines and deliverables: Get pinged in Slack when key milestones are completed or when a project is marked “red” (blocked). 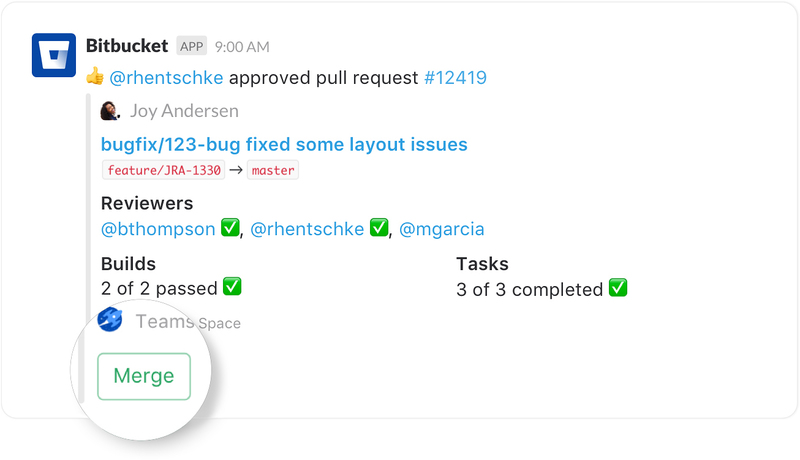 Manage resourcing: Get notified in Slack when a new project needs staffing. The Bitbucket app by Atlassian — which pulls alerts from code repositories into channels, replete with contextual information — now comes with new smart notifications. Not only can you take action on alerts right from Slack, but the app also analyzes your team’s usage and adapts to how you work. Create a pull request from a newly pushed branch. Reply to a pull request comment from Slack. Send a friendly “nudge” to a teammate about an overdue pull request. 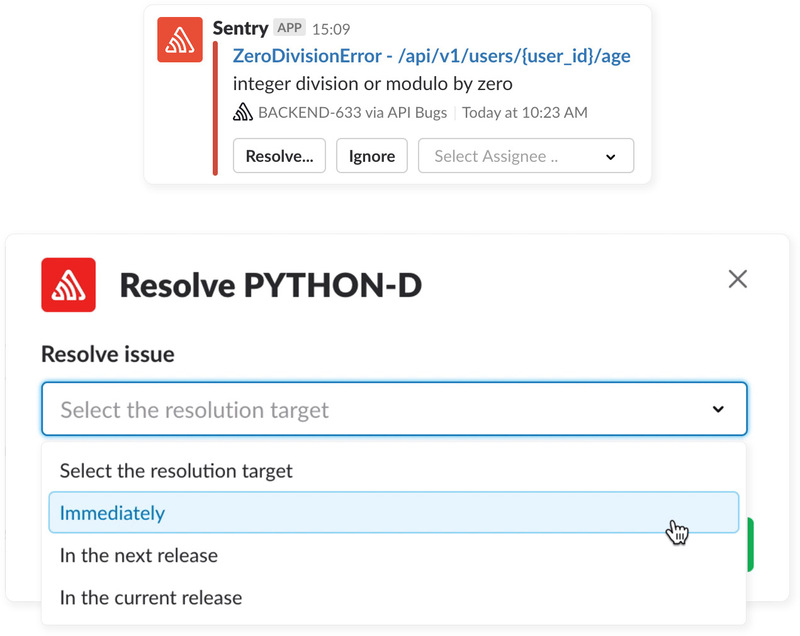 Sentry provides open source monitoring and error tracking, giving developers the specific details they need to fix issues in real time. A newly released, updated integration for Slack allows you to customize your alerts and send them to specific channels. When the notification pops up, you can acknowledge it, assign it to the right person, and tell them just how urgently the fix is needed. The whole team can rest easy knowing exactly who is on point to solve the issue and when they can expect it to be resolved. Get notified about critical errors in the Slack channel of your choice. Assign those alerts to the appropriate teammate. Set the urgency to better prioritize issues and improve time to resolution. Resolve issues right in Slack. You might be using a lead capture form on your site, a CRM, a marketing automation tool, and several other services that house important information. IBM App Connection makes it possible to pass data between these tools without having to use any code or specialized knowledge. Now you can also send this information to Slack channels to alert your team of key changes in customer behavior. Send a message to Slack when a new priority contact is created. Send daily summaries of event registrations into a dedicated channel. Post an update when a customer submits a help center ticket. 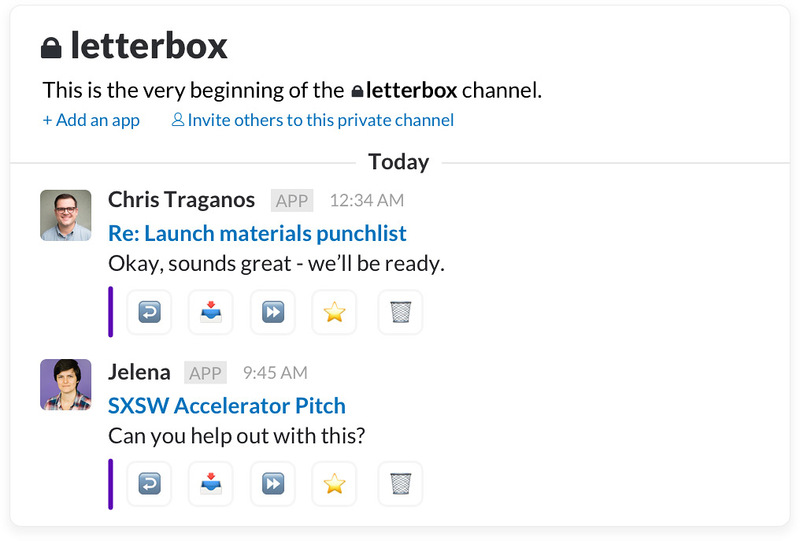 Letterbox connects to your Gmail inbox and forwards your emails to your own private Slack channel as they come in, so you never miss an important message. It even allows you to reply right from Slack. Read, star, and reply to emails. Manage your inbox by archiving or deleting messages. See what other tools connect to Slack and how they help teams get the information they need, when they need it. Visit slack.com/apps.